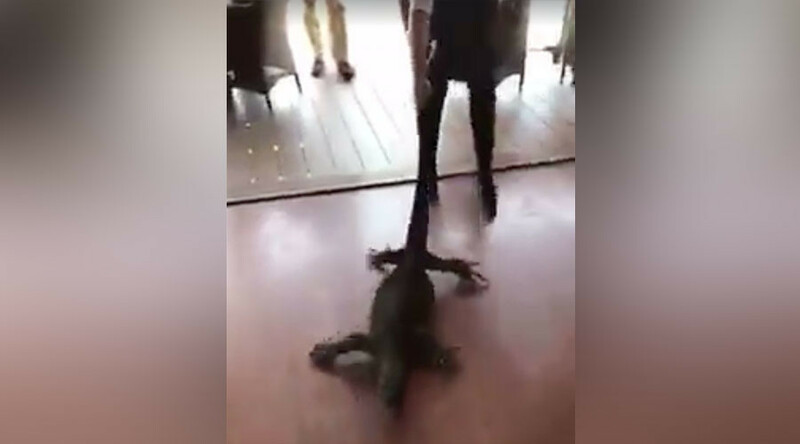 A French waitress showed off the dexterity and know-how of Crocodile Dundee when she confidently dragged a giant goanna lizard by the tail out of the restaurant where she worked. Samia Lila, 25, who is in Australia on a working holiday, became a viral sensation after footage of her evicting the reptile from Mimosa Wines in New South Wales was shared online. The waitress has been nicknamed “Goanna girl” after her impressive feat wowed diners and online viewers alike. The incident caused fleeting hysteria in the restaurant as customers screamed and cheered as she dragged the creature past their tables. Lila first thought she was merely dealing with a dog, according to Fairfax media, but carried on unfazed when she realized she was dealing with a large predatory lizard. “I wasn’t scared, I like reptiles so was a bit excited,” she said. Mimosa Wines owner Glenn Butson told Storyfu that Lila just thought that's what “Aussies do when a goanna comes inside,” recalling how he told her a story about removing one from his shower. The goanna monitor lizard typically eats smaller lizards, snakes, mammals and birds, along with insects and at their largest can grow up to 2.5 meters (8.2 feet) in length.